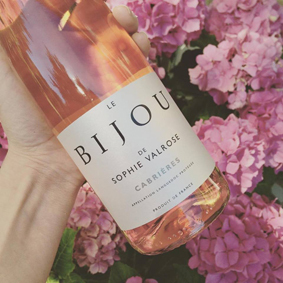 So thrilled to announce that our Le Bijou de Sophie Valrose, Cabrières Rosé has been awarded Silver at this year’s Global Rosé Masters. Direct from the beautiful hidden terroir of Cabrières in the Languedoc with its unique soil, high in schist, allowing for the production of some of the purest wines from the South of France. The rosé is blended from specially selected cuvées and crafted from Cinsault and Grenache grapes. As soon as you pour it into the glass you are transported to the idyllic Southern French countryside – it is summer in a glass, full of ripe red fruit and refreshing zestiness! With a warm bank holiday approaching this is definitely one to have chilling in the fridge to enjoy in the sunshine with friends or over a leisurely lunch. In fact, we’re off to pop one in the chiller right now!